Vegan diet is simple. It completely eliminates all animal foods from your diet. That includes meat, fish, dairy products and eggs. It also calls for you to avoid refined carbohydrates, artificial sweeteners and sugar. 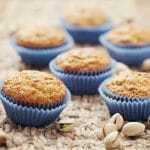 You can eat fruit, vegetables, non-dairy products, legumes, whole-grains, seeds and nuts. The challenge to a vegetarian diet is to make sure you get all the protein and nutrients your body needs to function. 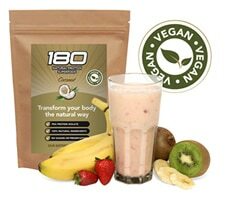 180 Superfood Vegan formula is 100% natural. The chosen ingredients contain everything the human body needs to maintain a healthy lifestyle. The powder has no preservatives, chemicals, refined products or additives. We use pea protein isolate in our vegan formula. It includes nutrients such as magnesium, sodium, potassium, calcium, zinc, iron and a rich source of B vitamins. The vegan formula ingredients are coconut flour, almond meal, cocoa, flaxseed, psyillium husks, stevia, chia seeds, sesame seeds, inactive brewers yeast, pea protein isolate, sunflower kernels and pumpkin seeds. The versatility of the Vegan Protein Powder makes it easier to eat right no matter where you are. You can sprinkle the powder over already prepared dishes or use to make your own vegan snacks. You can mix it with a non-dairy milk to make a smoothie or use in your baking. You can find some awesome recipes here. You can also use as a meal replacement. A vegan diet is a life choice and our vegan formula can help you to make sure you are having enough protein in your diet. The addition of Vegan Protein Powder guarantees that your body will receive all the necessary nutrition it needs without ingesting any harmful chemicals, additives or preservatives. Try a low-cost sample pack today.